The leading application for controlling Canon PowerShot cameras from a Windows PC. 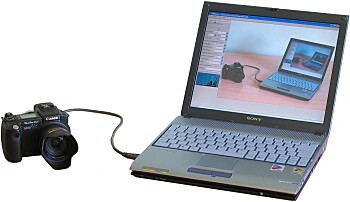 It gives a high degree of control over the camera and includes a live viewfinder display allowing the camera to be operated up to 5m (16 feet) from the computer using a standard USB cable. PSRemote includes a complete software solution for a professional photobooth. Please see our photobooth page to find out more. Please Note PSRemote was be withdrawn from sale on January 1st, 2018. Please see the news page for more information. Use motion detection to automatically take pictures for wildlife photography and security applications (requires Webcam Zone Trigger which must be purchased separately). What Do I Need to Install PSRemote? An internet connection and Windows 8.1, Windows 8, Windows 7 or Window Vista (32-bit versions only) installed on your computer. Older PowerShot models may also require Canon’s USB drivers to be installed on your PC. These are available on the disk supplied with your camera and can also be downloaded from Canon’s website. Please note that some older PowerShot models are not supported on Windows Vista, Windows 7 or Windows 8 and will only work on Windows XP. Microsoft ended support for Windows XP on April 8, 2014 and therefore we are no longer able test or support our software on Windows XP. PSRemote should still work on Windows XP however we strongly recommend that you upgrade to a more recent version of Windows. Photo booth operators and anyone who needs complete remote control of their Canon PowerShot camera from a PC. This includes event photographers, product photographers, online auction sellers, scientists and researchers, ID photographers, aerial photographers, animators and wildlife photographers. How Much Does PSRemote Cost? PSRemote costs US $175 (click here for free trial* or to purchase) and includes one full year of free upgrades. Breeze Systems also provides customized remote capture applications for Canon DSLR and PowerShot cameras. Contact sales@breezesys.com to discuss your requirements.